Looking for the best gluten free bread maker? The American Diabetes Association estimates that approximately 1 percent of the world’s population, or 70 million people, have celiac disease, a type of digestive disorder. A person with celiac disease will experience abdominal pain when they ingest food containing gluten as their body reacts by damaging the small intestine. The small intestine is responsible for absorbing nutrients from food, but is unable to do that if it is damaged. Therefore it’s absolutely vital that a person with celiac disease avoid gluten, which is typically found in wheat, rye, and barley. Some people who do not have celiac disease will follow a gluten-free diet because they are either sensitive to gluten or are gluten intolerant. In these cases, there is no damage to their small intestine, but they experience uncomfortable symptoms such as bloating, constipation, diarrhea, abdominal pain or discomfort, migraines, severe acne, headaches, or fatigue. To avoid these symptoms, one can simply follow a gluten-free diet. In addition, regardless of gluten sensitivity, many people who have tried following a gluten-free diet say they generally feel better and have more energy. But removing gluten from your diet can be difficult and frustrating, especially if you need to eliminate food as common as bread from your diet. The good news is that you can easily make your own gluten-free breads with a good bread maker. There are many bread machines on the market, but only some are programmed particularly with gluten-free settings. We tested and picked out the best bread machines for making gluten-free bread, which are listed below. The Zojirushi BB-PDC20 is one of the newest bread machines released by Zojirushi. We’d like to think of it as version 2.0 of the Zojirushi BB-PAC20 which we think is the best bread machine ever made. 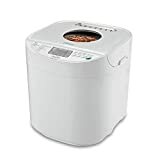 Now that the Zojirushi BB-PDC20 is released it’s our top pick when it comes to bread machines baking gluten-free bread and other gluten-free treats: donuts, apple walnut cake, carrot cake, green tea bread, raisin bread, pizza, and more. Compared with other bread machine manufacturers, Zojirushi is constantly experimenting with new recipes and they update their site with these recipes (pictures and steps included) that are tailor-made for this bread machine. There is a large selection of and focus on gluten-free recipes so it’s quite possible that you’ll never run out of new gluten-free recipes to try. And of course, the quality of the baked goods that come out of this machine simply cannot be matched by other machines. So you can’t go wrong with choosing the Zojirushi BB-PDC20 as your gluten-free baking sidekick! With this machine, you’ll turn your home into a gluten-free bakery. The T-fal PF311 is a great option for those who want to bake gluten-free bread at home without breaking the bank. There was actually an earlier model of this – the PF111 – that we thought was great for baking gluten-free bread, and it seems like with this newer PF311 they want this machine to focus particularly on gluten-free baking. That’s because with the PF311, there are three dedicated gluten-free settings – one for savory bread, one for sweet bread, and one for cake. One thing we want to mention is that the replacement parts for the PF311 are inexpensive, which is a big plus. With bread machines, you will need to replace the pan and/or kneading blades down the road, which may come as a surprise to some people. We know of no bread machine that won’t need at least one of these parts replaced eventually, so please keep this in mind! Bread machines are like cars – both have moving parts and parts that eventually wear out. Replacing the pan and kneading blade is similar to replacing the brake pads on your vehicle. Overall, the T-fal PF311 is great choice when it comes to gluten-free baking. The beautiful Breville BBM800XL is a high performer when it comes to making gluten-free bread. If you want to make gluten-free bread with fruit and nut, even better. There’s a dispenser that automatically releases the ingredients at the perfect time. It’s a smart bread machine with many programmable options, so even if your recipe doesn’t turn out right the first time, you can adjust it easily. We know that baking gluten-free breads require a lot of trying to get the recipe and timing just right. This machine calculates the settings for gluten-free bread so you can get the recipe right quickly. 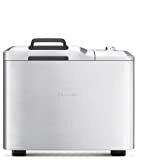 The Hamilton Beach HomeBaker comes in two colors: white (29881) and black (29882). It’s the best value bread machine for baking gluten-free bread. Not only is gluten-free bread expensive to buy at the store, the options are minimal. So it makes sense to invest a little in a bread machine that can help you bake gluten-free bread at home. The Hamilton Beach fills the gap for those who want a gluten-free bread maker at an affordable price. As one of the best-selling bread machines on the market, the Oster CKSTBRTW20 is also known to handle gluten-free bread well. Depending on the bread maker, gluten-free recipes can easily turn out tasting “off”. But the Oster CKSTBRTW20 turns even gluten-free bread tasting like any other bread from the bakery, which is why it deserves to be on this list. We want to remind everyone that getting a quality gluten-free flour is important. The brand we recommend is Bob’s Red Mill and Pamela’s Bread Mix. We find that mixing in different kinds of flour produces delicious bread too so give it a try. Thanks for the info. I spent most of yesterday trying to get the dough right for high-altitude gluten-free bread. I’m ready to make my life easier! I live in Calgary, AB, Canada, so higher altitude of 1045. What did you do to adjust the gluten free bread maker bread recipe. would you share your best recipes for gluten free bread maker? (fyi for all. High altitude is generally 3000′ (915 m) or higher.) If you’re finding that your bread is rising too fast, you can try either decreasing the yeast slightly or increasing the salt slightly. If you’re finding that your bread is excessively dry, maybe try increasing moisture. I live at 4500′ in the high desert and find my flour is definitely drier at this altitude. For example, when I make pie crust, I have to almost double the liquid! While all of my baking has been gf for almost 5 years, I don’t have experience with doing gf bread in a machine yet so can’t offer a recipe for that yet.